“Given the empire’s multitude of political units, varying in size, structure, and relative position, students and scholars of early modern German history are accustomed to sorting a profusion of names, places, titles, and events. Stollberg-Rilinger makes this difficult task more bearable, not only through her writing—by stating, rather than merely suggesting, the point of each vignette—but also, more importantly, by articulating a “logic” of the empire’s great constitutional complexity, and its transformation. Her descriptions, here skillfully rendered in Dunlap’s translation, show that legal history can vividly link the ideational and the material.” · Law & History Review. 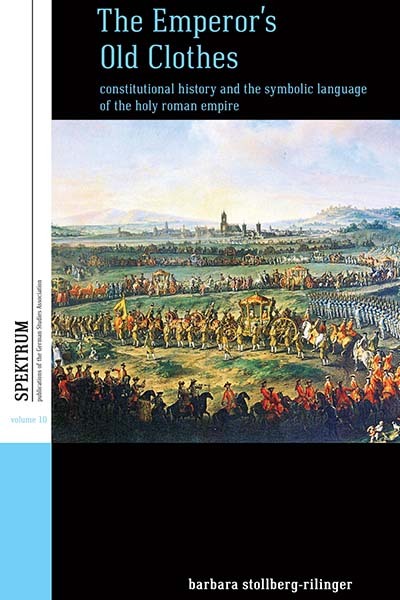 For many years, scholars struggled to write the history of the constitution and political structure of the Holy Roman Empire. This book argues that this was because the political and social order could not be understood without considering the rituals and symbols that held the Empire together. What determined the rules (and whether they were followed) depended on complex symbolic-ritual actions. By examining key moments in the political history of the Empire, the author shows that it was a vocabulary of symbols, not the actual written laws, that formed a political language indispensable in maintaining the common order. Barbara Stollberg-Rilinger is Professor and Chair of Early Modern History at the University of Münster. She is the author of Das Heilige Römische Reich Deutscher Nation: Vom Ende des Mittelalters bis 1806 (2009), Europa im Jahrhundert der Aufklärung (2000), and Rituale (2013). In 2005 she received the prestigious Leibniz Prize of the German Science Foundation, in 2003 the Prize of the Historical Collegium of the Bavarian Academy of Science.